Justin Jennings picked up the 4th last-place finish of his NASCAR Camping World Truck Series career in Saturday’s Careers for Veterans 200 at the Michigan International Speedway when his #36 Mittler Bros. Machine & Tool Chevrolet fell out with handling issues after he completed 6 of the race’s 100 laps. The finish was Jennings’ first of the season and his first in a Truck Series race since last fall at Phoenix, 14 races ago. Last year’s finish at Phoenix put Jennings in a tie with Caleb Roark for the 2014 LASTCAR Truck Series Championship, a battle won by Roark when his #0 Chevrolet trailed the field in the season finale at Homestead. This year, coming into Michigan, Jennings had made eight Truck Series starts, splitting time between the team’s primary #63 and the “start-and-park” #36. One of those co-drivers, dirt tracker Bobby Pierce, stunned at Eldora in July by winning the pole and finishing a close 2nd to Christopher Bell, earning MB Motorsports its first-ever top-five finish in its twenty years on the circuit. At Michigan, Jennings would run the #36 for the second-straight race as the primary #63 went to Garrett Smithley. Smithley, a 23-year-old rookie from Georgia who made his series debut earlier this year at Atlanta, finished a strong 16th two weeks ago at Pocono and the decision was made to keep him in the truck. Jennings, meanwhile, would have to wait until next Wednesday’s race at Bristol to try and improve on his season-best 22nd at Kentucky - the only race this season he’s finished under power. Jennings and Smithley were among the 34 trucks on Michigan’s preliminary entry list, but the field was shortened to 33 following the withdrawal of open-wheel driver Shigeaki Hattori’s #18 Goodyear Toyota. 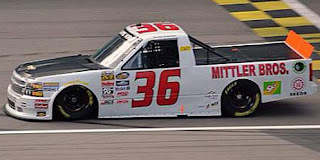 Hattori, whose 10th and most recent start as a Truck Series driver came at Nashville in 2005, looked to debut his own team, but the truck was withdrawn before a driver was announced. Jennings, meanwhile, timed in 25th of 29 trucks in Friday’s opening practice and 27th of 32 in Happy Hour. He then secured the 24th starting spot with an average speed of 175.268 mph, well ahead of Timothy Viens, the lone DNQ in Mike Affarano’s #03 RaceDaySponsor.com Chevrolet. Viens, still looking to make his first Truck start since Dover in May, was faster than Jennings in Happy Hour, but was 5 mph slower in qualifying. The 32nd starting spot went to fourth-year driver Tyler Tanner, another of the drivers sharing Jennings’ #63 ride at MB Motorsports. At Michigan, Tanner drove for MAKE Motorsports in the #50 Shane Duncan Band “Life’s Snooze Bar” Chevrolet which fell out after 16 circuits and came home 29th. By then, Jennings had already exited six laps into the race followed by part-timer Todd Peck in his family-owned #40 Arthritis Foundation / OSS Health Chevrolet and B.J. McLeod, his sixth bottom-five finish in seven starts in 2015 driving the #45 Tilted Kilt Chevrolet. Rounding out the Bottom Five was Caleb Roark, who remains tied with 27th-place finisher Norm Benning for the 2015 LASTCAR Truck Series lead. Roark now matches Bennings’ 4 bottom-five finishes, but still trails Benning in the title hunt in a bottom-ten tiebreaker of 10-4. Smithley, Jennings’ teammate, finished a career-best 14th in Mittler’s #63 BRUH / SegPay Chevrolet. *This is the first last-place finish for the #36 in a Truck Series race since last fall at Texas, when defending LASTCAR XFINITY Series Champion Blake Koch drove Mittler’s #36 Mittler Bros. Machine & Tool Chevrolet 3 laps into the Winstar World Casino and Resort 350 at Texas before rear axle issues. *This is the first last-place finish for both Jennings and the #36 in a Truck Series race at Michigan. *Jennings is the first Truck Series last-placer to fall out with handling issues since September 8, 2013, when Chris Lafferty’s #0 Koma Unwind / Driven2Honor.org Chevrolet fell out after 5 laps of the Fan Appreciation 200 presented by New Holland at the Iowa Speedway.